I am going to be honest I am not a coffee drinker at all. However, hubby loves to drink coffee every morning. In fact, it is no surprise when you see him make him a cup of coffee in the middle of the day. Especially, the days when he is doing college work. I do love the smell of coffee just the taste is not for me. 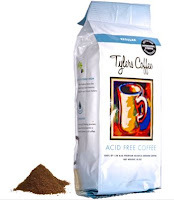 When Tyler's Coffee offered to send me their Acid Free Coffee in Regular, my hubby was excited. He loves to try new brands and new flavors. The high acid amount found in coffee is one the largest contributing factors the high increase of acid related diseases in our society. Acid can contribute to your stomach beening upset, deteriorating of teeth and bitter bite after every sip. The tannic and lipid acid blooms on the bean during its roasting process. The acid amount varies according the quality of the coffee and how it is roasted. Due to Tylers Coffee innovative Z-Roasting system, they have accomplished the perfect acid free coffee. Deliciously smooth, no bitter bite, bold Italian roast with double the amount of natural antioxidants and caffeine. Their commitment to being as natural as nature has to offer while using only the highest quality is their commitment to you. They use only AAA Arabica coffee for the highest quality of coffee that nature has to offer. One "Perk Pack" will make approximately 18 cups of delicious acid free caffeinated coffee. 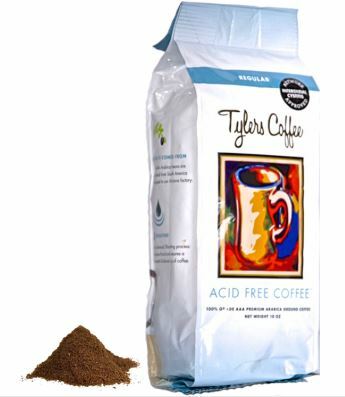 Tyler's Acid Free Coffee will not contribute to acid related problems such as tooth enamel decay, acid reflux, indigestion, upset stomach or heartburn. Check out our Testimonial Page! One "Perk Pack" will make approximately 18 cups of delicious acid free decaffeinated coffee. Each bag contains 5 perk packs. During my review, we received two 2oz. packets of Tyler's Coffee in regular. With one coffee packet, we were able to add 10 cups of purified water. We used purified water because I did not want our tap water to give the coffee an unpleasant taste. During the roasting of the coffee, I was happy with the smell. It offers the prefect roasting of coffee smell and it just filled the house. Hubby however did the tasting and he was impressed with the taste. He did state that it did have a different taste then other coffee’s that he drinks on a daily basis. He was happy with the results he got from drinking the coffee when it came to his teeth. During his time of drinking the Tyler's Coffee he didn't notice a change in the color of his teeth like some coffee can cause. If you are looking for living a healthier lifestyle but you do not want to get rid of your coffee. I highly recommend Tyler's Coffee. With all of the benefits, it offers this is differently the coffee to drink. I myself did take a sip and was more impressed with its taste quality then other ones I have tried. Where to purchase: You are able to make a purchase from the Tyler's Coffee website. You can also use the store finder tab to find a store near you to make a purchase.